On Tuesday night, Central Student Government approved resolution A.R. 7-019, which paves the way for the UM Board of Regents to set up an ad hoc committee to investigate multiple companies, who, according to the resolution, help supply weapons “that violate Palestinian Human Rights.” The bill is sponsored by Students Allied for Freedom and Equality (SAFE) who have attempted to pass a divestment initiative on this issue for nearly a decade. However, in a shameful display of hypocrisy and betrayal of their liberal values, CSG decided to support a resolution that only props up one “marginalized” group in order to push down another. The session began with speaker Alexandra Contis naming the guest speakers for each side of the resolution, with many CSG members quickly moving to stop Professor Victor Lieberman, an expert on the Israeli-Palestinian conflict here at the university, from speaking against the resolution. LSA representatives and other students claimed that if Lieberman were allowed to speak it would create an “unfair power gradient” between professors and students in the debate, creating an unfair forum with no other professors speaking for the resolution. In addition, many students who supported the bill claimed many professors support the resolution, but would not speak out in fear of losing their jobs. Despite obtaining broad and wide ranging respect as a historian of Southeast Asia and on the Israeli-Palestinian conflict particularly, CSG declined to hear the expertise of Professor Lieberman for reasons that are as perplexing as they sound. It is sad and ironic that the resolution supporters, despite holding up signs saying “Stop Silencing Us,” silenced the one person who could give the proper context on the issue. Ultimately, their reasons did not amount to anything legitimate. Having one professor speak on a topic he has expertise in does not create an “unfair power gradient”, all it does is silence someone from giving an informed historical perspective on a particularly tense issue. CSG and SAFE showing their support for his absence indicates that many of them would rather hear things that confirm their own opinions than actually have an open forum for debate and discussion. At no point did anyone from Hillel or any other Jewish group advocate for any of their guest speakers to leave or not speak. While there may not have been a professor amongst them, many of those groups were committed to keeping an open forum for debate and voting. The fact that students who advocate so openly for free speech and inclusion would so quickly silence someone else is thoroughly disturbing. 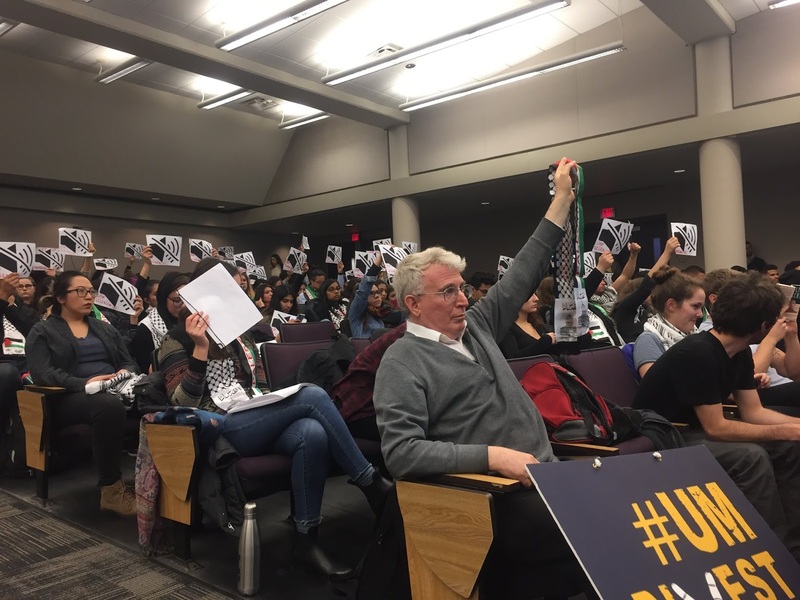 It is sad and ironic that the resolution supporters, despite holding up signs saying “Stop Silencing Us,” silenced the one person who could give the proper context on the issue. His notes would eventually be given to and read by public policy Senior Samuel Lawrence, but the symbolic damage had already been done. The night continued with extremely divisive and harrowing debates full of personal testimony. It was heart-wrenching and upsetting to witness, and I acknowledge fully that both sides of this conflict have committed and experienced acts of violence, none of which I will ever be able to fully comprehend. Much of it was a distraction from the true effect of this bill — to force the university’s hand to condemn Israel, and to make a repulsive statement to Jewish students on campus. Much of the debate centered around the Boycott, Divestment & Sanction movement, which, as the name suggests, is an effort to boycott, divest, and sanction anything relating to Israel and their “illegal occupation” of the West Bank. Politics aside, the movement has resorted to intimidation of Jewish students on campuses across the country, and encouraged many to create a following to pass similar resolutions. It has also increased anti-semitism across the country, raising alarms from many important groups, including ADL. This points to something that is simply impossible to avoid: if CSG and members of SAFE truly cared about divestment, then it has more to do with condemning Israel and less with human rights. However, SAFE continuously claimed that they had absolutely nothing to do with the BDS movement, in spite of open support from the BDS and mentions of BDS in current and former resolutions. Numerous supporters of the resolution from SAFE made the claim that this resolution is only concerned with divestment, and therefore is not apart of the broader BDS movement. However, as Vice-speaker Ali Rosenblatt said eloquently, this is simply “BS.” SAFE also tried to avoid being labeled as anti-semitic, and I commend them for making an honest attempt to write a divestment bill of Israel that had nothing to do with Judaism. However, as Ford School representative Andrew Watkins explained, what is not always anti-semitic in language is anti-semitic in action, and that regardless of a specific “whereas” clause saying the resolution was not anti-semitic, its goals and aims stem from a deeper movement, rooted in anti-semitic ideologies. As CSG President Anushka Sarkar explained, Israel was mentioned “18 times” despite the fact that other countries such as Lebanon and Syria have committed human right abuses against Palestine. This points to something that is simply impossible to avoid: if CSG and members of SAFE truly cared about divestment, then it has more to do with condemning Israel and less with human rights. As debate continued late into the night, several CSG members wanted to vote by secret ballot, in order to protect the “integrity” of the vote without leading to further intimidation. In particular, a “blacklist” was mentioned, run by a group called “Canary Mission,” which posts a list of students, professors, and other individuals that promote “hatred of the USA, Israel and Jews on college campuses in North America.” This is a serious problem and I absolutely condemn any blacklist that attempts to intimidate or bully people into abandoning their beliefs. However, CSG needs to answer to the students, and the representatives perpetuated the blacklist as a way to avoid having to be accountable for their votes. If these students seriously cannot stomach the idea of dealing with detractors for their votes, then, with all due respect, those students never should have been involved in CSG. There are hundreds of people in public office who constantly get threatened for things they are passionate about. Yes, CSG representatives are college students, but one of the most important features of democracy is the ability to know how our representatives vote, so we can hold them accountable for their actions. It provides a record that those who run for public office have to be responsible for. That way, if our candidates or representatives are not voting the way we would like, we can vote them out of office. The fact that our student representatives abandoned this principle for one vote that they supposedly felt extremely passionate about is shameful and a disgrace to the constituents they are supposed to represent. It takes away from their power to know whom they are voting for and find representatives that advocate for our goals and agendas. The people who claim to accept all identities voted for a resolution that attacks my identity, and the identity of a group that has consistently been marginalized throughout history. Perhaps this will come off as harsh or angry, but there is no way I can sugarcoat the pain and anger that both myself and many in the Jewish community feel. The people who claim to accept all identities voted for a resolution that attacks my identity, and the identity of a group that has consistently been marginalized throughout history. Yes, I am white, and while there are certain forms of marginalization I can never understand, it does not mean that I nor other Jewish students experience anti-semitism in ways that are just degrading and horrifying. All this proposal did was validate the marginalization of Jews by a group of people who identify with openness and acceptance of people of all races, cultures, and identities. That was a political philosophy I fell in love with in high school, and now, as a freshman, I have come to realize that those who would promote ideals of acceptance would just as quickly belittle and downgrade me for simply being Jewish and believing in a Jewish State. The pain I feel is impossible to put into words. Ultimately, I hope that in future years my new campus will prove me wrong and show that this campus and our representatives care about promoting all races and identities, rather than saying it only for show. I see you have moved on from one aspect of the Israeli-Palestinian conflict, of which you have no knowledge or context, to a confusing two or more other aspects of the Israeli-Palestinian conflict, of which you have no knowledge or context. But I am sure the Israeli security strategists will appreciate your vital input. Netanyahu is building settlements in the contested regions, and giving people homes he knows Palestinian troops are likely to blow up. If Netanyahu had actually waged a proper battle against Hamas and the PA, then he could have been considered being against terror. And considering how powerful the Israeli military has shown itself in the Six Day War, he might have defeated them. But chumming a deadly enemy with one’s own citizens is not a just war tactic by any stretch. For being against terrorists killing Israeli civilians and then getting paid to do it? Okay. I’m a crackpot. Is Netanyahu also a crackpot? Both right!? Nope. Do you want me to cut and paste your original comment? You just got done saying someone is a “crackpot” for merely introducing the very concept of Arabs remunerating terrorists to the tune of millions of dollars; you conveniently skip over a Wall Street Journal report confirming it; then you link to self-contradictory report in the Washington Post that nevertheless not only establishes the fact that the U.S. government has for years been addressing this very reality that you initially denied, but has in no way rebuked anything other than noodling minutia. I guess since you linked to it, this would make you a “crackpot,” too. It looks like we were both half right. Note especially this statement near the end. I read a lot. That’s how I know that RT is a propaganda rag from the Kremlin. It took only a minute of Googling to reveal that Lahav Harkov writes for RT. Nice try. About as “crazy” as expecting someone unhinged like you to read something other than Facebook slogans. Do you know how crazy that sounds? You’ve just lost all credibility with me. You’re a crackpot. Of course I know more about “what’s really happening” in Israel–Palestine than you. You make that plainly apparent. That’s why I’m not mindlessly, lazily assigning false equivalence between a country and people that have historically faced existential threats against their very existence even before Israel was granted statehood — and murderous neighbors who were not even codified as a singular group of people until the 1960s, who openly and repeatedly call for Israel’s annihilation while remunerating terrorism to the tune of millions of dollars of humanitarian aid money even as I write this. When you skip over even the basics of the actual dynamics of the Israeli-Arab conflict to assert some delusional, meaningless equivalence, you are indeed essentially apologizing for terrorism — among other things. But you are right in admitting you don’t really know what’s going on, so you might as well stop with your unfocused arguments based on absolutely no facts at all (regardless of what you think I know) — and spare me the tedium of pointing out the obvious. I am not an apologist for terrorism. But I am not an apologist for declarative loyalty either. I don’t know what’s really happening in Israel-Palestine, and neither do you. Almost nobody knows. I refuse to choose between two equally suspicious narratives to pretend to believe one side. Free thought and skepticism do not impugn my identity as a Jew, a Liberal-Centrist, an American, or anything else. I am not like Trump calling terrorists “fine people”. Quite the opposite! I’m assuming the absolute worst about everyone involved. I’ve seen nothing to suggest otherwise. Yes, history is about agency AND cause and effect, neither of which you have any evident knowledge about on this issue. And, yes, there is something extremely lazy about calling out a false equivalence when it doesn’t exist. You have yet to factually rebuke anything in the link that addresses this (your) brand of fraudulence. History is more than just cause and effect. It’s also agency, and the combined influence of countless spoken arguments. If you “grasp” a 50-year-old vengeance, and refuse to “pose” a “humanitarian” objection against it, then you’re part of the problem. There is nothing “lazy” about calling out equivalence — when it actually exists. Not sure if you even have a point, since I was asserting the situation in Israel-Palestine is nothing like Apartheid South Africa as well. But just throwing out lazy false equivalence and hyperbolic rants is another type of moral — if not intellectual — vacuity, that reveals absolutely no grasp of historical cause and effect. Please show us where the article to which I linked is factually wrong, other than it clashes with the tiresomely simplistic narratives of self-aggrandizing humanitarian posers. There is nothing “hateful” about calling out hate — when it actually exists. The Israel-Palestine conflict is not “Apartheid”. In Apartheid South Africa, the Zulus were the good guys, and the Boers were the bad guys. But in this case, there is no such distinction. This is a morally vacuous feud between two insanely bellicose governments, with millions of civilians on both sides taking the fall with their lives. The article you linked to is just as hateful as the comments you complained about. Obama was correct to implicate the settlements, which are now being rebuilt. And Netanyahu has proven himself to be a racist warlord. Trying to deflect my point? It shouldn’t be necessary to invoke hegemony at all. It should be obvious that the Occupation is a sin against G-d. But if G-d won’t stop you, then the world’s hegemony — which happens to be nominally European in this era, but will probably soon be rebranded without substantive changes — has to do something. It is not “self-important” to consider ourselves stakeholders in a nation that’s supposed to represent all of us. Apart from the fact that your reply is a non-sequitur, it would be consistent with the overbearing self-importance of Europeans to deem that a treaty ending a war between European countries -some of which no longer even exist- has vocation to be imposed for ever on the entire planet, including countries which never signed it. And American-Europeans are an invention of King George 3 and George Washington, so who’s counting? Israel and Palestine both have common-law status as countries. The Treaty of Westphalia, which applies to the entire world, requires that all countries are disjoint regions of land. Both Israel and Palestine are guilty of violating that treaty against each other, and mass murder to boot. Another anti-Israel rant filled with absurd hyperbole, histrionics, Orwellian distortion of terminology and a paucity of facts and historical context. For 70 years, a group of Arabs who refused to even establish their own single-state solution, claiming they were but extended denizens of other countries, attacked and a people who genetically and historically trace their roots to the land of Israel before the Muslim Faith even existed. United Nations General Assembly Resolution 3379, adopted on November 10, 1975 by a vote of 72 to 35 (with 32 abstentions), “determine[d] that Zionism is a form of racism and racial discrimination”. Zionism IS racism! Boycott Apartheid Israel! Zionism is the liberation movement on the Jewish people in its ancestral land, after 2700 years of successive invasions and colonization by all the European and Middle Eastern Empires of history, 2700 years of exile, for the Cochin Jews and the Bne Menashe Jews, 2400 years of exile, for the Bne Dan/Beta Israel Jews, 1800 years for the Ashkenazi Jews, and 1400 years, for the Sephardi Jews, including the Arab invasions of 638 CE, 950 CE, and 1290 CE, and the failed attempts of 1948, 1967, and 1973. 70 years ago, there was NO Arab Palestinian state, “Palestine” was a British colony since the fall of the Ottoman Empire in 1917 and the Palestinians were the native Jews. Local Arabs were mostly nomadic, except in Yaffo and Haifa, and refused the moniker of “Palestinian, which they considered a slur for the Jews, while they proudly claimed their Syrian or Arab identities. Palestinian-Arabs are an invention of Yasser Arafat and the USSR in 1967. It is sad to hear that the author identifies with a brutal and criminal state such as Israel. This is the work of the Zionist movement, to equate Judaism with Israel. Nothing can be further from the truth. It is undisputed, that for almost 70 years, Palestinian people have taken the brunt of Israeli brutality. Michigan students (SAFE) are basically demanding divestment from the most hideous of all industries, the “War Industry”. Michigan students (SAFE) have risen on behalf of humanity.